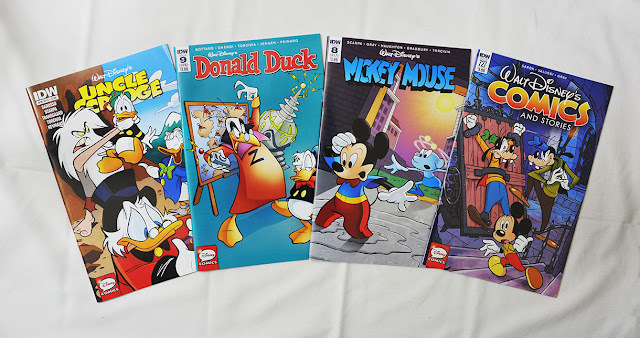 I might be a bit late with this post, but my local comic shop hasn’t received this week’s new Disney comics yet. So here are some quick comments on last month’s issues instead. I’ve read everything in this issue before, so to me it was a boring start of this year’s IDW comics. But for those who haven’t there’s a lot to enjoy! The main story is an old weird Italian story drawn by Romano Scarpa. I like that IDW bring new life to these oldies, and even if the plot often make no sense or just is a sequence of crazy events they are fun to read. "The Eternal Knot" is also a good example of how Scarpa bring motion and action to every panel, there’s no "wooden" characters just standing there talking in this story! As usual when I have another copy of a story, I like to do a quick comparison. And it looks like IDW did another silly gunfire censoring in this story. In my Norwegian copy we can see a lot of bullets flying when the hermit fire his blunderbuss. They are removed in the IDW print. But you can clearly see the hats are filled with bullet holes later. This was my most anticipated issue in January. I’ve been wanting to read the first Zantaf story for a long time, but it hasn’t been printed in a language I can understand until now. "Tycoonraker" is also the second "McDuck Intelligence Agency" (MIA) story, so to get the most out of the story I would recommend to also read "Moldfinger or The Spy Who Ducked-Out On Me". It’s printed in Boom!’s first (and only) volume of "Donald Duck Classics". The book was really overpriced in my opinion, but you might be able to find a used one. I expected more of an origin story of Zantaf, but he is just introduced as another mad scientist without much background information. So I guess I liked the story more as the second MIA story than the first Zantaf story. But now that we got introduced to the character I hope we get to see him again. 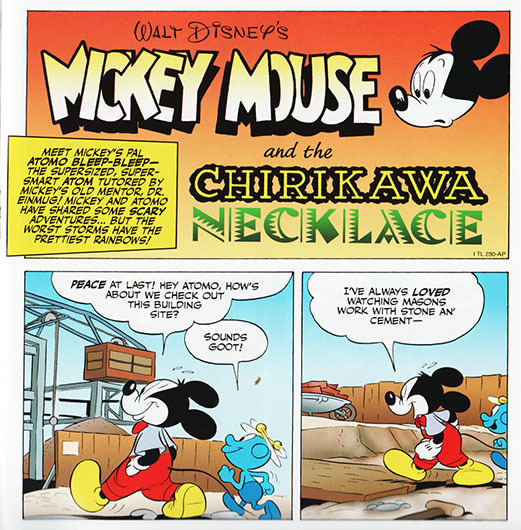 "The Chirikawa Necklace" is a real Mickey mystery story, and a favorite of mine. It’s highly recommended! 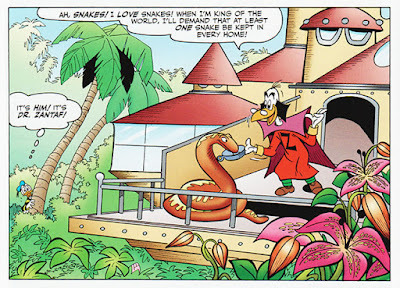 This story also features three (later recurring) characters of Scarpa’s creation. We have the first appearance of both Aunt Melinda and Pete’s girlfriend Trudy in addition to Atomo. But I think the name Doctor Proctor must be added by the translator. Proctor was a regular character in the Mickey newspaper strips, but not used at the time this story was created I believe. We also got the Super-Goof story "Polar Opposition!" in Mickey Mouse #8. I’ve read this one before too, but now I got to see the first page! 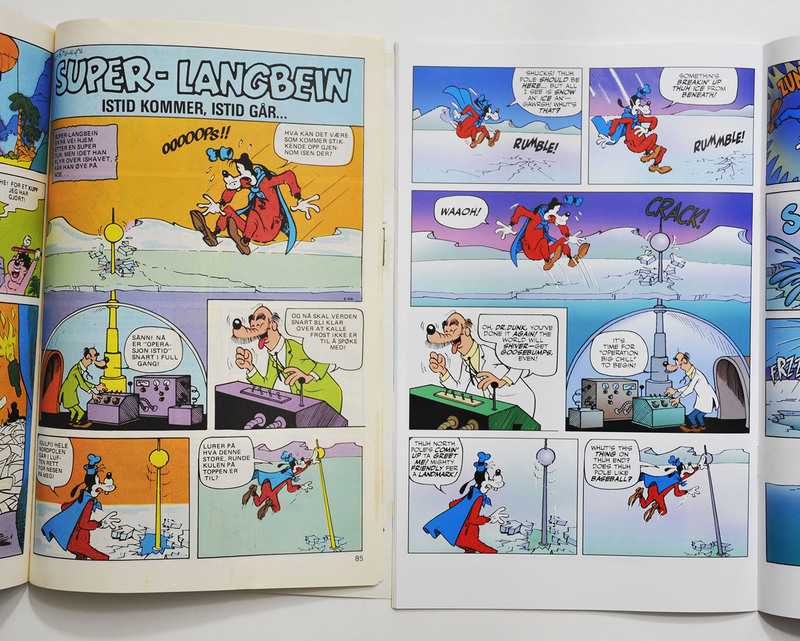 That page was cut when the story was printed in Norway, while the original page 2 was reorganized to be the first page. WDC #727 features chapter 7 of "The Search for the Zodiac Stone", with Goofy’s French double. But did you know the cover originally was intended to be even more evil looking than it is? 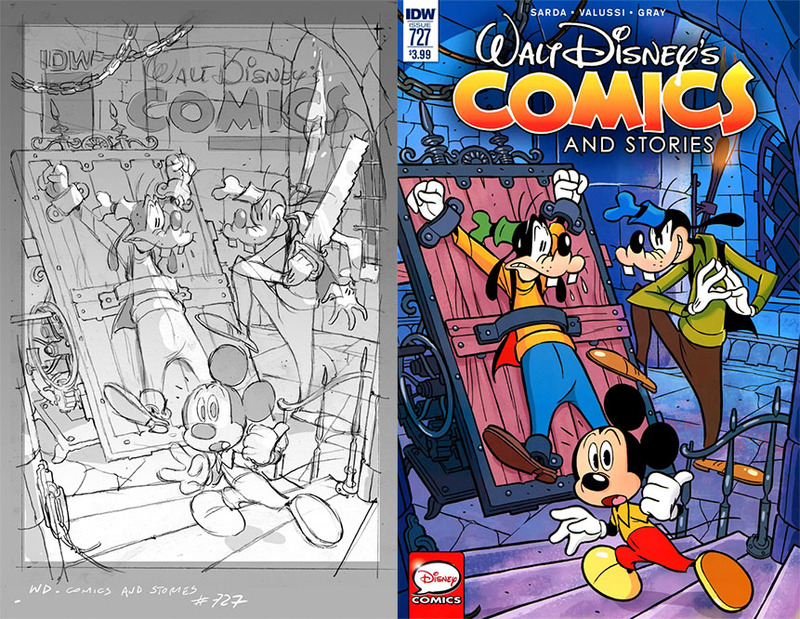 Andrea Freccero posted a sketch for the cover on his blog in October last year. And compared to the final cover we can see the saw was removed. Valentine's Day comes fairly *early* in February. We put "romantic" content in the January issues so they'd have some time to sell before Valentine's Day itself actually hit. 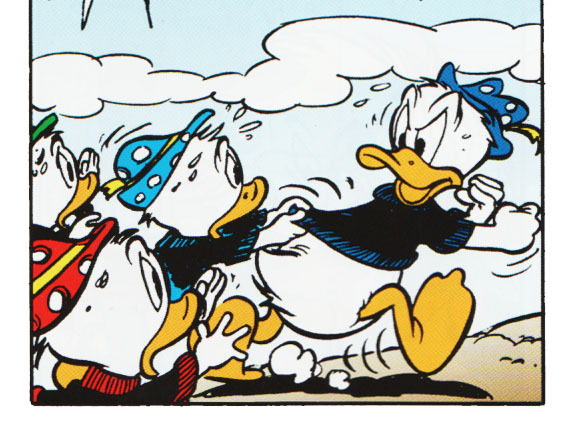 As translator, I called the doctor Proctor because his physical appearance (if not outfit) was quite similar to the later Gottfredson character—to a point where I'm not sure another name would have felt appropriate. I agree that the two doctors look similar. I also had to check out "The Incredible Black Comet". I can't remember noticing the use of Statics name (and the first name Cosmo) when reading that story. But yeah, the scientist in that story looks a lot like Static! I also noticed that the logo now used on IDW's Mickey Mouse covers was used for the American print of "The Incredible Black Comet".